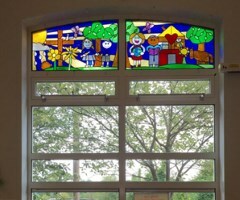 The Tushingham-with-Grindley C of E Primary School of Cheshire, England in collaboration with my company The Stained Leaded Glass Company recently created this wonderful stained glass panel for a hall in the school. I ran a day-long project with the children, teaching them what stained glass is and how it's made. I then provided them the opportunity to design and make their own small stained glass windows from coloured film. Their designs were based on their lives and the things they enjoy. 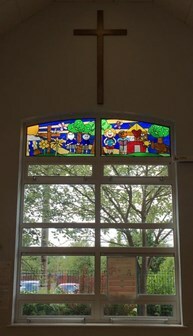 The premise behind the main window was the school prayer, and the components of the design were based on drawings that the children produced. Every child in the school was involved in the project and thoroughly enjoyed the process. My daughter Bethany and I took the children's drawings and produced a design using Glass Eye 2000. It was made by my nephews and we installed it in June 2016. The Stained Leaded Glass Company is a family-run business started by Andrew Seddon. He hails from Bolton, England, where he is a former Chartered Engineer with a passion for stained glass as a hobby. He started making stained glass in 1991, initially working from his kitchen table but soon moving into a workshop in an old Methodist church near his home. After two years in the church workshop, the demands of his young family inspired him to move to a larger house, so he built a purpose-designed studio on the grounds of his home. 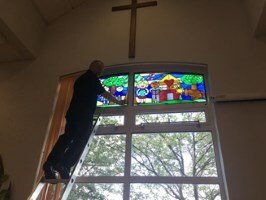 He has worked with many schools to introduce stained glass to children of all ages, and also has adapted the children's designs to make unique works of stained glass art that embody the ethos and values of their schools. His daughter Bethany now works for the company and helps to design new stained glass windows using Glass Eye 2000. Andrew and Bethany collaborated on this project to create the finished design. Please visit them on Facebook and follow them on Instagram (stainedleadedglassco) or Twitter (@MyStainedGlass).